Kaffir Lime Leaves Are Perfect For Adding Flavour To Your Asian & Indian Recipes! Here's How To Grow Your Own Kaffir Lime Tree In Your Apartment! I have been wanting to grow a Kaffir Lime tree for awhile now. Often Kaffir leaves are called for in Asian and Indian recipes. The scent of the leaves is really nice. The tree stays fairly small, and it is native to Asia, so it thrives in a warm humid climate. Lately, I've been on watching auction websites to see if I could find a small Kaffir Lime tree, but I didn't find any in my area. However, I did find some seeds. The seller said that the seeds were fresh from Thailand. We shall see how they turn out. I thought I would share the journey with everyone. Find some 'Fresh' Kaffir Lime seeds. The package I got had 5 seeds altogether. I am going to try to germinate all of them and if I get more than one tree I'll give it away. They seeds are fairly inexpensive. Soak the seeds in slightly warm water or lukewarm water for a couple of hours. Get some plastic containers. Mine are 10cm by 10cm. One for every seed. Sow the seeds half an inch into the soil. Cover lightly with plastic wrap. Seeds can take up to 16 days to germinate. For the seeds to germinate, it needs to be at least 26 degrees Celsius, or 80 degrees Fahrenheit. My apartment stays around 23C. I'm hoping they will stay warm enough in the sun. I've read that others use a heating mat to set the containers onto, and then set the mat to desired temperature. That's an option for someone who isn't germinating in the summer. Keep the soil moist but not soggy. Put near a window, in direct sunlight. Otherwise, set it under a grow light for at least 8 hours a day. It can withstand at the lowest 4.5 degrees Celsius, if you wish to have it outside. Change some the soil every few years. Fertilise monthly during spring and summer. Is it only during germination the seeds need to be 26 degrees? Is it okay if they get colder during night time? Is there any chance for it to grow lime fruits in a place like Sweden? Yes, only for seed germination. 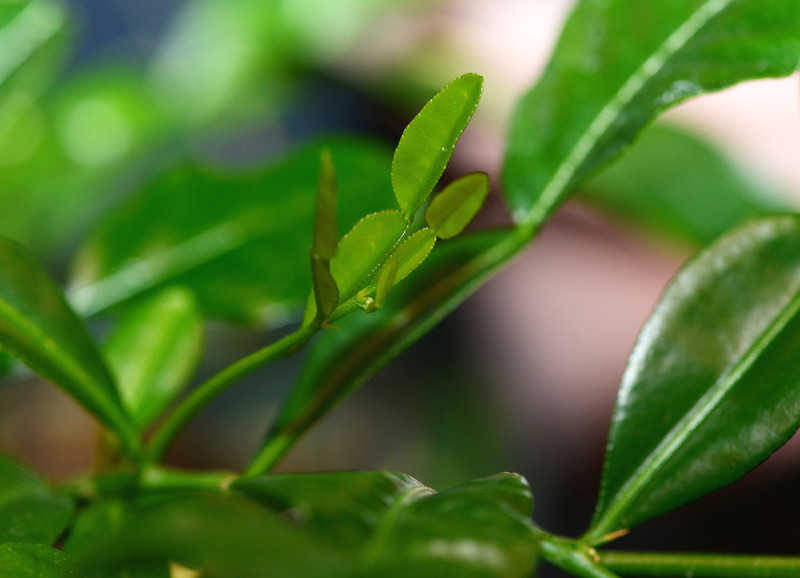 The plant can withstand temperatures as low as 4.5 degrees Celsius. Although, that is not an ideal condition so it will not grow fast. But during the summer you can leave it out at night after the last frost date. It is defiantly possible to get limes in Sweden during the summer. As long as you have it in direct sunlight, and set on the balcony from time to time to allow for pollination of flowers. But, with Kaffir the real joy of the plant, is its leaves. The rinds of the limes are used as well. But the fruit itself is extremely sour, but still used for certain recipes. Okay. How about lemon then, can you grow them the same way with seeds from lemons you buy in a grocery store? Yes, you can. Most often lemon (actually most fruit bearing trees) trees are grown from cuttings of a tree that is already an established tree that grows good fruit. That way you don't have to go through the trouble of growing from seed. Growing from seed can be sort of a gamble because you don't know if the tree will ever grow fruit, or grow good fruit. Plus it takes a number of years before fruit will grow, even under ideal conditions. That's why gardening teaches patience. Aha, gardening doesn't go well with ADD then. :-) Maybe I should cut a branch from our cherry tree and see if I can get that to grow indoors and produce cherries. That would be cool. That would be really cool, you need rooting hormone, I believe. I often see flower boutiques selling cherry tree branches with blossoms. They are really pretty. I am allergic to most flower smells so whenever my lemon trees blossom I have to put them on the balcony, otherwise I get sick. Thats also why I do not grow plants that flower in my apartment.